So begins Greg Lucas’ captivating account of life as a husband, a police officer, and Jake’s dad. Jake Lucas, the first of four children, lives with severe physical and mental challenges. Caring for him each day is an ordeal few of us can imagine, and this story of Jake’s first 17 years is not one you will soon forget. But the remarkable thing is how the whole narrative is saturated with wonder at the grace and goodness of God, who brings hope and promise through his Son into the darkest of circumstances. In this book, we see that Jake’s problems are our problems, only bigger, and the challenges of caring for him carry profound lessons about God’s care for us. 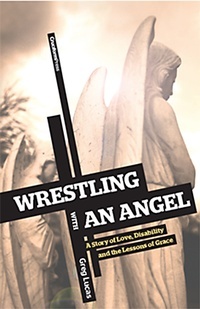 Wrestling with an Angel is about tragedy and laughter and pain and joy. It is about faith and grace and endurance and God’s unfailing, loving wisdom daily being worked out in each of our lives, whatever the nature or extent of our difficulties. Here is a book that may explain faith to you in ways you never quite grasped, through a life few of us can relate to. When it is all done, we come away better able to live as Christ calls us to live.